on overcoming doubts (doubt is torture; don’t listen to it). She shares the story of how her studies with her Zen Master, Katagiri Roshi, and beat icon Allen Ginsberg awakened her to writing as a creative and spiritual practice. From writing wherever we are now... to working fearlessly through obstacles... to writing from the body, Goldberg explains her methods that have helped new writers get started, and seasoned writers keep going. In her afterword Goldberg muses on her journey as a writer. She discusses topics such as discipline, talent versus effort, writing and meditation, the relationship between place and writing, and reasons why people do not write. The advice in Writing Down the Bones will inspire anyone who writes—or who longs to. Writing a book is a fine and fleeting thing. We need to have a larger vision. Think of writing as a lifetime relationship… Writing lets us drop our edge and merge with everything. Natalie Goldberg is a poet, teacher, writer and painter who has been a student of Buddhism for over 30 years. Among her other books are Wild Mind, The True Secret of Writing, and Living Color (a book of her wild, colourful paintings). With insight, humor, and practicality, Natalie Goldberg inspires writers and would-be writers to take the leap into writing skillfully and creatively. She offers suggestions, encouragement, and solid advice on many aspects of the writer's craft: on writing from "first thoughts" (keep your hand moving, don't cross out, just get it on paper), on listening (writing is ninety percent listening; the deeper you listen, the better you write), on using verbs (verbs provide the energy of the sentence), on overcoming doubts (doubt is torture; don't listen to it)even on choosing a restaurant in which to write. 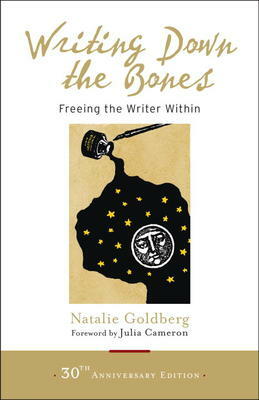 Goldberg sees writing as a practice that helps writers comprehend the value of their lives. The advice in her book, provided in short, easy-to-read chapters with titles that reflect the author's witty approach ("Writing Is Not a McDonald's Hamburger," "Man Eats Car," "Be an Animal"), will inspire anyone who writesor who longs to.